The topology of completely wireless networks is unclear in a static analysis. By default, the configurator assumes all nodes can directly talk to each other. When they can’t, the error rate metric can be used for automatic route configuration instead of the default hop count. It contains seven AODVRouters laid out in a chain. description = "Completely wireless network, static routing based on error rate metric"
The transmitter power of radios determine their communication range. 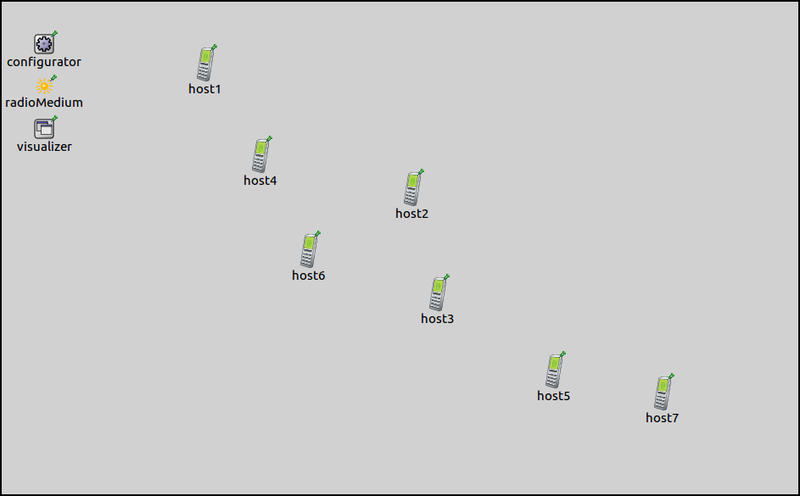 The range is set up so hosts are only in range of the adjacent hosts in the chain. RoutingTableCanvasVisualizer is set to visualize routes to all destinations. The routing table visualization is simplified by turning off arrow labels, and setting the arrow line shift to 0. The latter setting causes the visualizer to draw only one arrow between any nodes even if there would be multiple arrows, e.g. one for both directions (bi-directional routes will be displayed as bi-directional arrows now.) Communication ranges of all hosts will be displayed. The transmission power outside the communication range is below the sensitivity of the receiving node, thus, the error rate is infinite. However, the fact that the receiving host is within the communication range circle doesn’t mean that it can receive the transmission correctly. It contains a copy of the default address configurations, and an <autoroute> element using the error rate metric. The configurator calculates the packet error rate for a Maximum Transfer Unit (MTU) sized packet. Edge costs in the connectivity graph are assigned accordingly. Configured routes and communication ranges are displayed on the following image. Error rate outside the communication range is infinite, thus, all arrows are within the circles. Routes lead through adjacent hosts in the chain. In each segment of the path, correct reception is possible. 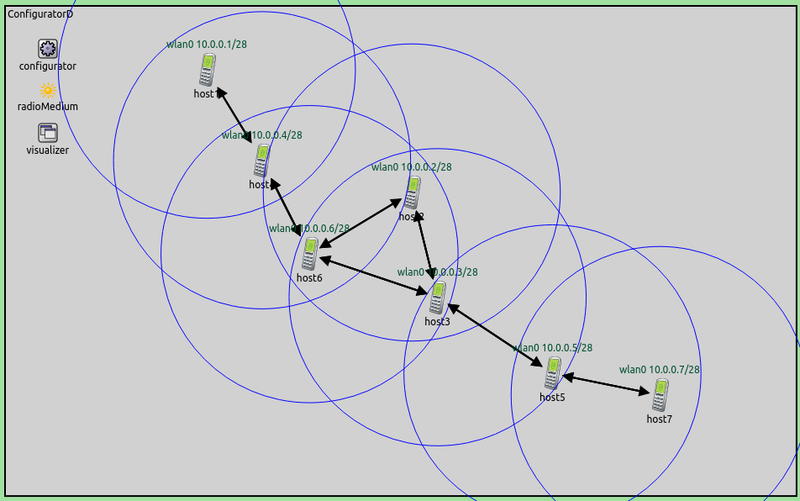 Static routing is often not adequate in wireless networks, as the nodes might move and the topology can change. Dynamic routing protocols can react to these changes. When using dynamic protocols, the configurator is only used to configure the addresses. It leaves the routing table configuration to the dynamic protocol. 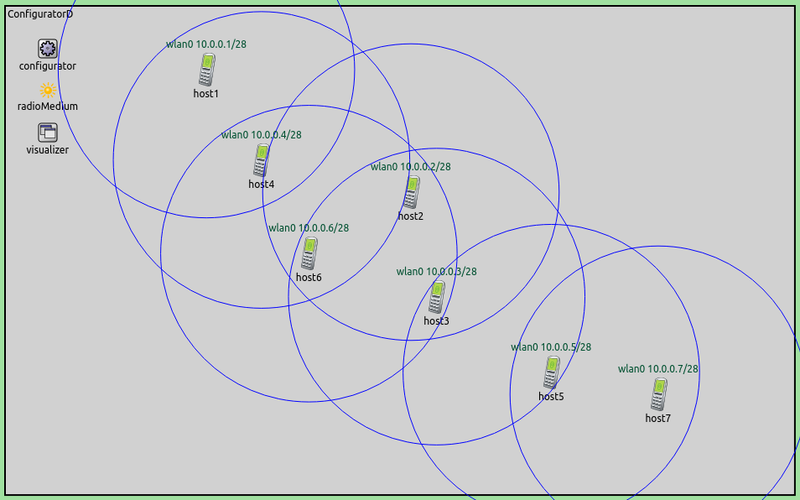 description = "Completely wireless network, routing tables unconfigured, prepared for MANET routing"
The configurator is instructed to leave the routing tables empty, by setting addStaticRoutes to false. The configurator just assigns the addresses according to the default XML configuration. The visualizer is still set to visualize all routes towards all destinations. As instructed, the configurator didn’t add any routes, as indicated by the lack of arrows. The routing tables are empty. description = "Completely wireless network, routing tables unconfigured, using AODV routing"
As specified in the previous part, the configurator is still instructed not to add any routes. Also, the visualizer is still set to visualize all routes. Additionally, host1 is set to ping host2. Since AODV is a reactive routing protocol, the ping is required to trigger the AODV protocol to set up routes. The routing tables are initially empty. The first ping packet triggers AODV’s route discovery process, which eventually configures the routes. AODV is a reactive protocol, so unused routes expire after a while. This happens to the routes to host2, as it’s not in the path between host1 and host7. This is displayed in the following video. To record the video, the simulation was run in fast mode, thus, routes appear instantly. It takes a few seconds simulation time for the unused routes to expire.